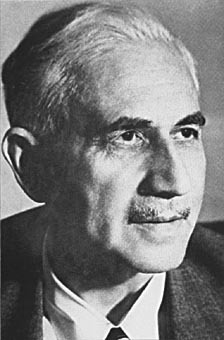 German biochemist Otto Meyerhof's most famous work was the demonstration of a fixed relationship between the consumption of oxygen and the metabolism of lactic acid in the muscle. It won him the Nobel Prize in 1922, shared with English physiologist Archibald V. Hill. His parents were both Jewish, but amid the growing anti-Semitism of 19th-Century Germany, Meyerhof was raised in the Lutheran church. Despite the Nobel honors and his administrative post at the Kaiser Wilhelm Institute, he was ordered to stop teaching in 1935. In 1938 he fled Germany for France, and when the Nazis invaded France he came to America, where he joined the faculty at the University of Pennsylvania and lived the last decade of his life. His son, Stanford physics professor Walter Meyerhof, was among the more outspoken debunkers of "cold fusion" in the 1980s.